Small asteroids are faint and hard to detect. Many times they are not spotted until they approach Earth's orbit very closely. A newly discovered asteroid named 2017 OM1 is a good example of this, and its story gives some insight into the challenges of trying to protect ourselves against asteroid impact threats. This was also a call for any professional and amateur astronomers to obtain as many observations of the object as possible before it passed. Likely, most astronomers observing at the time would've known about this object from NASA/JPL Sentry, which contains all the known objects that pose a risk of Earth impact in the next 100 years. Additionally, NASA/JPL Scout provides a list of all unconfirmed objects that still need follow-up. These pages are constantly updated, and objects are often removed as more data is gathered. Absolute Magnitude (H) >=22.0...which roughly corresponds to a 140m diameter. To put that in perspective, the asteroid that produced the meteor airburst over Cheylabinsk, Russia on 15 Feb 2013 was roughly 20m in diameter. 2017 OM1 has a diameter of ~74m, or 3-4x larger. While the Cheylabinsk Meteor produced an airburst that damaged a few buildings and injured about 1500 people (mostly due to shattered windows), nobody died. A larger asteroid, like 2017 OM1 would produce an airburst similar to the magnitude of the Tunguska Event on 30 June 1908. This asteroid/comet impact flattened 80 million trees over 2150 square km of dense forest. This would have destroyed a large metropolitan area. The Tunguska event is the largest impact recorded in human history and the poster-child for Asteroid Day, the internationally observed awareness day for asteroid impact hazards, held annually on June 30. More data means lowering the "uncertainty" of an object's orbit and having a better idea of where exactly it will be many years in the future. The MPC provides a precise definition of this uncertainty parameter and how it is calculated. Basically it's a number between 0 and 9, where "0 indicates a very small uncertainty and 9 an extremely large uncertainty". In the case of 2017 OM1, the uncertainty was at 7 when the MPC confirmation went out. After obtaining more observations in the last few hours before it passed Earth, the uncertainty dropped to 5. That's an improvement, but it's still a bit of a problem. The object passed close enough to the Earth that its trajectory changed slightly as it passed. The gravitational sphere of influence of Earth is 924,000km, or roughly 2.41 LD. Whenever an object passes within Earth's sphere of influence, its orbit will bend slightly, and the object will exit the sphere of influence on a different orbit AND at a slightly different speed. This effect becomes greater the closer the encounter. 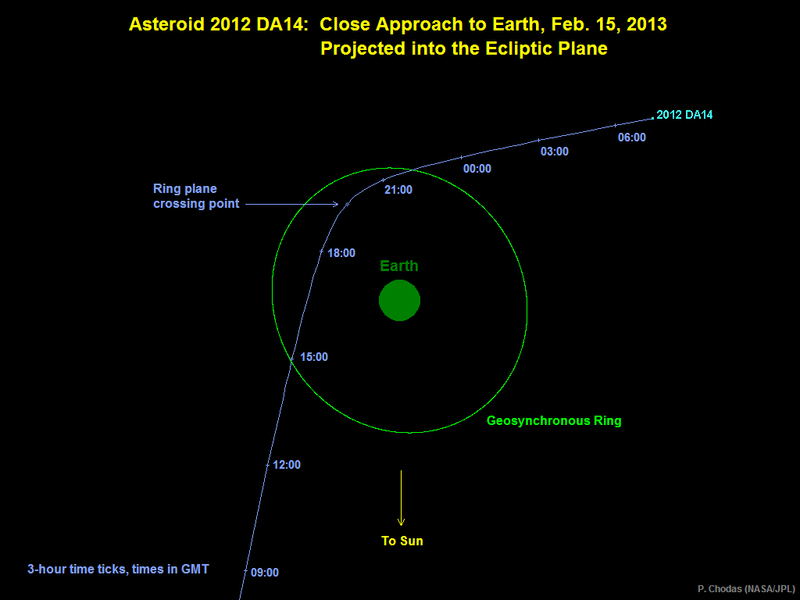 Here is an example of 2012 DA14 passing within 0.07 LD from Earth on 15 Feb 2013. 2012 DA14 passed closely on EXACT same day as the Chelyabinsk Meteor, but both were unrelated, separated by hours and on different orbits. Astronomers knew 2012 DA14 was coming but not the Chelyabinsk Meteor. With such a close pass, the change in trajectory is very noticable. Since a close pass will result in a change in orbit, it is very important to track the object as it exits on this new trajectory. In the case of 2017 OM1, it's no long observable after its close encounter with Earth since it will be on the sun-facing side. So, this uncertainty in the orbit calculation has the potential to grow larger when calculating the orbit further into the future. Radar observatories, however, can be used during the day and during inclement weather. From what I understand, the most important parameter to consider for planetary radar astronomy is the ratio of signal to noise. This depends on a few major factors like size of the target, distance from the target, and to a lesser extent rotation period of the target. There is an online calculator available from the National Astronomy and Ionosphere Center (NAIC), which operates Arecibo Observatory. It would be, but we're currently taking a hiatus as we do some upgrades. See latest tweet from the @AreciboRadar acct. Goldstone and Arecibo were both down for repairs/upgrades. Furthermore, the diameter of 2017 OM1 (74m) was roughly just over half of what is needed for PHA designation. While it was good target and only available for a short time, it likely would not have been prioritized against other observation objectives. That's less than 10 days between first observation and completely unobservable. The good news is that it will definitely miss Earth at a great distance (59.9 LD) on 20 Jul 2018 even with its current orbital margin of error. Hopefully asteroid surveys will pick it up on next close approach and the orbital uncertainty will drop significantly. We were fortunate this time and need to continue vigilantly scanning the skies while improving techniques. A few objects like 2012 TC4 and (3122) Florence will approach Earth closely in the next few months and put all of these planetary defense detection and characterization capabilities to the test in different ways. 2012 TC4 will test the close-approach monitoring. It's relatively small (12-27m) but will pass very close at 0.23 LD (possibly as close as 0.03 LD). It will be visible as it approaches its near pass on 12 Oct 2017.
which caused the global mass extinction that wiped out the dinosaurs. We're on the right track, but we also can't be complacent. Let's keep learning! Let's keep growing!